Sometimes you can't avoid having open-ended questions where respondents type in unstructured text in response to your question. In the past, it would take days or even weeks to have the open-ended responses coded and re-run as quantitative questions. Survey Analytics gives you the power to see the results of your open-ended question in a quick glance with the use of tag clouds, sometimes also called word clouds. Tag clouds are a graphical representation of the frequency of different words in a dataset; the more frequently the word appears, the larger the word appears in the tag cloud. 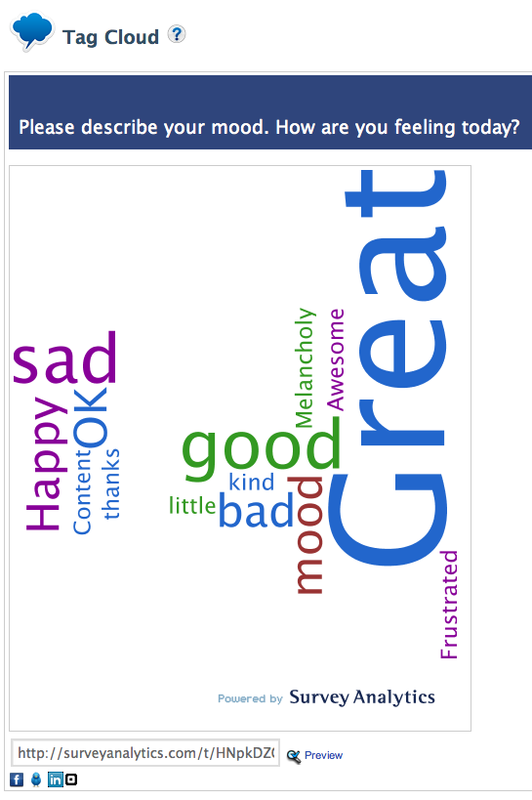 The example below shows a tag cloud for an open ended question asking respondents to describe their mood. Survey Analytics also gives you the ability to easily exclude certain words from the tag cloud analysis. With Survey Analytics' tag cloud feature, you can get a quick glance at your open-ended data to get a sense of respondents' sentiment prior to any additional analysis you may choose to do. Here is a brief YouTube video tutorial walking you through the process of creating tag clouds in Survey Analytics. Also, here is a link to a Survey Analytics help file explaining the process step by step.